Ladakh bike trip is an ultimate challenge for adventure enthusiasts. The ‘Land of High Passes’ has some of the scenic trails thriving with adventures. Riding a bike through these challenging routes is simply matchless. 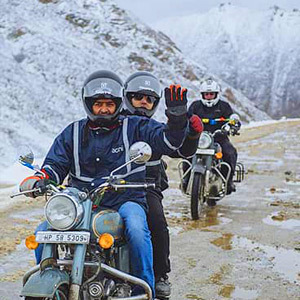 For your quest of adventure ‘Ladakh Bike trip 2019’ provides an exhilarating journey of 8 Days and 7 Nights. The highlight of the bike tour is ride through the High Mountain passes, the region is so well-known for. In fact, you will pass Khardung La-one of the highest mountain passes in the world. Moreover, the beauty is truly out of the world. 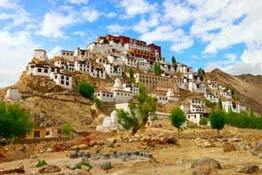 In addition, experience Ladakhi culture at the ancient monasteries. Camp on the shores of one of the most beautiful lakes in the world, Pangong Tso. Peruse the itinerary below for complete details. Pass through high-altitude Baralacha Pass, Rohtang Pass, Khardung La, etc. Arrive at Manali, where you will be met by our tour representative. Get assisted with transfer to hotel. After few hours of rest, enjoy a late afternoon visit to Solang Valley. After orientation, here you can indulge in activities like ropeway, quad biking & paragliding. On your way to get back to the hotel, pay a visit to Vashisht temple. Here you can take blessings of the Rishi Vashisht after which the place gets its name. Also, take a dip in the famous natural hot spring. Later, get back to the hotel. The rest of the evening is free for you to explore the city of Manali. Begin your day with hearty breakfast at hotel. Later, start your journey towards Jispa. Enjoy the picturesque beauty of the environs while your ride your bike. Pass through Rohtang Pass, Gulaba, and Marhi and Koksar. Stop for lunch at Koksar. Stretch your legs and breathe in the fresh air. Later, continue with your bike trip. Stop at Jispa, where you will be done for the day. Check in to the camp at Jispa. Freshen up with evening tea with snacks. You are free in the evening to enjoy the beauty of the place. Overnight stay in the camp. Hearty breakfast charges you for the day as you start towards Sarchu. On the bike tour, stop at photographic locations to soak in the beauty and stretch your legs. The highlights of the journey are the charming village of Darcha, beautiful Baralacha La mountain pass, Zingzing bar, etc. Halt at Bharatpur tent colony for lunch. (Location might change as per the time). Today you will pass through constant changes in landscape. Keep your cameras out for number of clicks. By evening you will arrive to Sarchu, where you will also halt for overnight stay. After breakfast get back on the road. Today you will ride to Leh city and arrive by evening. The changing landscape will keep your spirits high. Take halts for some of the most mesmerizing views. 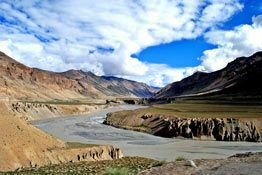 You will pass through Tanglang La Pass and arrive to the Ladakh region by evening. On arrival check-in at the listed hotel/guest house. If time and your energy permits stroll around the town and markets. Overnight stay in hotel in Leh. Start the day early. 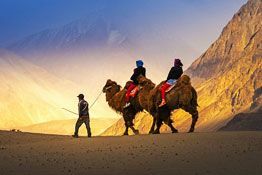 Have your breakfast and proceed with your bike to the Nubra Valley. On the way, stop at South Pullu to take a break. Here you can stretch your legs and also have some snacks. Later, continue with drive to Khardung La, one of the highest mountain passes in the world. Later, stop at north Pullu for another break. Proceed to pay a visit to the Diskit monastery. Afterwards, head towards Hunder sand dunes. The desert complete with sand dunes is a unique spectacle. Making your visit all the more special are the double-hump Bactrian camel. Take a ride and enjoy the views. Check in to your camp and freshen up. Interact with fellow campers while enjoying your meal at the camp. Overnight stay in the tents. Wake up amid the natural spectacle. Freshen up and have breakfast. 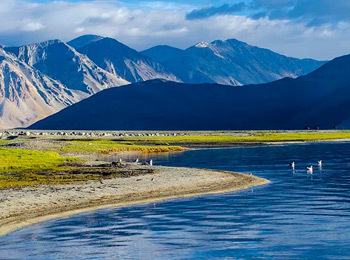 Later, begin your drive alongside of the River Shyok to arrive to the Pangong Lake. Enjoy the picturesque beauty and get to spot memuts. Stop for lunch at Durbok. Later, proceed to Pangong Lake. On arrival at the campsite, check in to your tents. Enjoy the view of sunset from the lake shores. Also, enjoy the open clear skies and have a great time stargazing. 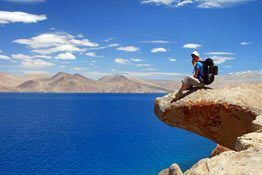 Wake up to the bliss of Pangong Lake. Early mornings are ideal for bird watching. The view is surreal and you must capture as many memories as you can. Even photography is out of the world in the morning light. Later, bid adieu to Pangong Lake. On the road enjoy the amazing sights and stop for snack at numerous pictorial locales. Stop at Chang la, one of the highest mountain passes in India and among the highest in the world. Here, you can spend some time in the café. While enjoying the beauty, treat your taste buds. Later, continue with your drive to Leh. On arrival check in at hotel for overnight stay. Start the day with a hearty breakfast at hotel. Later, checkout and avail transfer to Leh Airport. Board the flight for your onward destination. 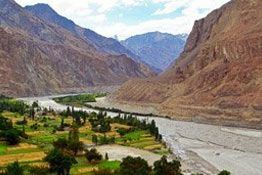 All hotel, guesthouse and camping charges in Manali and Ladakh (Single/ Twin/ Double) room sharing basis as per above mention cost. 350cc Royal Enfields for riders. Tour leader and tour guide. Luggage racks and bungee cords for strapping on soft luggage. Backup pickup Tempo or Balero pickup and mechanic. First aid kit and oxygen cylinder & Helmets. All Hotels with breakfast & dinner. Rain Court/ Gumboots Shoes High Ankle. 5% GST will be applicable on total package amount.